C. S. Lewis was an internationally renowned British author, literary critic, and scholar who is now best known for his beloved children's fantasy series, The Chronicles of Narnia (1950-1956). As a writer adept in numerous genres, Lewis was also an highly popular Christian apologist whose various books, articles, and radio programs brought many to a new understanding of the Christian faith. His work is also credited with converting many people to Christianity, including his wife Joy David Gresham. Lewis's most popular works in this area include The Screwtape Letters (1942), Mere Christianity (1952), The Four Loves (1960), and his autobiographical Surprised by Joy (1955). Other popular works include his science fiction Space Trilogy -- Out of the Silent Planet (1938), Perelandra (1943), That Hideous Strength (1946) -- and his study of medieval love literature The Allegory of Love (1936). Lewis was a member of the Inklings literary group and a close friend and supporter of J. R. R. Tolkien. He is often credited with encouraging Tolkien to complete his famed Middle Earth saga. Clive Staples Lewis was born 29 November 1898 in Belfast, Northern Ireland, to Albert Lewis, a respected Police Court Solicitor, and Flora Hamilton Lewis, a promising mathematician. Lewis's parents shared a passionate love of literature, and filled the family home with a sumptuous collection of books on every imaginable topic. Young Clive, or Jack as he liked to call himself, grew up blessed with plenty of free time to explore the rambling bookcases and concoct imaginative tales of his own. In concert with his beloved older brother, Warren, he created a rich fantasy world, with Jack's contributing a land called "Boxen," populated by talking animals. This nearly idyllic existence was ended by the death of his mother in 1908 when Jack was nine years old. The following month he was sent away to boarding school, the first of which was run by a sadistic headmaster, later dismissed and certified insane. A long and trying period in English schools, relieved only by the discovery of Wagnerian opera and Norse mythology, passed before Jack was finally allowed to leave school and resume private study. In 1914 he moved in with William Kirkpatrick, former headmaster of Lurgan College, and a friend of the family. Kirkpatrick had previously tutored both Jack's older brother Warren and their father Albert as well. In later years Jack recalled he was tremendously impressed with Kirkpatrick, and called him "a man as honest as daylight". He further noted that Kirkpatrick never let him get away with unexamined answers. Kirkpatrick was, in addition, "a hard, satirical atheist", while Jack, who associated Christianity primarily with "ugly architecture, ugly music, and bad poetry", had always found church services dull and meaningless. Under Kirkpatrick's influence he felt encouraged to think for himself, and not to flinch away from his conclusions, even about spiritual matters, merely because they were unpopular. During this period Jack's studies focused on Greek and Latin, logic and rhetoric, subjects chosen to improve his bid for an Oxford scholarship. But he was also allowed free time to indulge his interest in poetry, mythology, and writing. He stumbled across the works of Christian author George MacDonald and was especially impressed by Phantastes, MacDonald's high-minded tale of a young man's genteel adventure into the fairy realm. Lewis credited the story with baptizing his imagination and opening him up to an appreciation of the holy, and in later life Lewis often referred to MacDonald as his "master". One cannot help but think to that Lewis's interest in that form of beautiful longing that he also called "joy", was first inspired by MacDonald and his highly spiritual Victorian romanticism. In 1917, Lewis won his scholarship to Oxford, but after only a few months' enrollment he left to join the military, against his father's wishes. He was first billeted at Oxford's Keble College while he completed officer's training, and there befriended fellow Irishman (and Ulsterman) Edward "Paddy" Moore. As the two became close, they allegedly made a pact: if one of them were killed, the other would look after the aging parent of the deceased comrade. Jack meanwhile was becoming friendly with Paddy's mother and little sister during visits to the family home. Then first Paddy, and then Jack, received a commission and shipped out. Jack, who was serving in the 3rd Battalion of the Somerset Light Infantry, was wounded in the Battle of Arras, at Mount Berenchon on 15 April 1917. A British shell, fallen short of the mark, exploded and wounded Lewis in the hand, leg, and chest. One shrapnel fragment lodged so near his heart that it could not be safely removed, and so was left intact, only removed years later in 1944. Owing to the strength and severity of his injuries, Jack was sent back to England to recuperate. A short time later Paddy Moore was killed in battle. After his discharge from the army in 1919, Jack Lewis returned to Oxford to resume his regular studies. He visited with Paddy's mother and young sister, and before long arranged for them to move in with him and set up housekeeping. It was an arrangement that would later put Lewis historians into disagreement over the true nature of the relationship. Some assume it that it most surely had a sexual component, at least fleetingly. But others point out that it was common in those days, before refrigerator and microwave ovens, for a young bachelor to retain the services of an older housekeeper -- and that placing Mrs. Moore in the role was both charitable and understandable given Jack's early loss of his own mother. In any event Jack remained a faithful guardian of Mrs. Moore's welfare, even putting her name on the deed to The Kilns, the house he co-purchased with his brother Warren. When circumstances in her later years required moving her to a nursing home, Lewis was a frequent visitor. His studies at Oxford were completed in 1924, and Lewis subsequently took up a position on the faculty. One year later he was elected a Fellow of Magdalen College, where he would spend the next 29 years before moving to Cambridge. His teaching duties soon encompassed philosophy as well as English language and literature. During a faculty meeting at Oxford's Menton College he met a fellow enthusiast of Norse mythology, J. R. R. Tolkien. Tolkien invited Lewis to join the Coalbiters, the club he had formed for this interest. In the early 1930s their association gave rise to a small literary group called the Inklings whose membership included such friends and notables as Charles Williams, Hugo Dyson, Owen Barfield, Dr. Robert Havard, Weville Coghill, and even Lewis's brother Warnie. The meetings, held in a pub nicknamed the Bird and Baby, and the banter was jovial, literary and philosophical. The common interest: fantasy literature and Christianity. The focus on the latter would once have made Lewis's membership improbable, to say the least. His commitment to forgo conventional truths in search of something more compelling, consistent, and genuine had only intensified his boyhood aversion toward the Church. Painful life experiences such as the early loss of his mother and the "the shadow of the last war and presently the experience of it" had all combined to lend him "a very pessimistic view" of existence, of God, and of Christianity. But in preparation for his teaching duties at Oxford, Lewis delved more deeply into philosophy. As he put it, he couldn't teach what he only grasped hazily himself. His explorations included Bradley, Hegel, and Berkeley, encompassing questions of epistemology, of man's relation to the cosmos, and of course the existence (or lack thereof) of God. He read Chesterton's The Everlasting Man and was powerfully moved by its arguments. Eventually his growing spirituality progressed into actual theism: "In the Trinity Term of 1929 I gave in, and admitted that God was God, and knelt and prayed." Through his friendship with Tolkien, he came to believe that Christian mythology was in fact the outward manifestation of a deeper truth. Throughout his conversion, and thereafter, Lewis remained a deeply independent thinker, moved by both reason and passionate feeling to discover his own truth, his own unique relationship to his deity. Much of the early part of this journey inspired his first major work, The Pilgrim's Regress (1933). Although it was initially rejected by both the critics and the public, his later works did strike an immediate chord. The most popular of these included The Screwtape Letters (1942), in which a senior devil advises his nephew on how to lead a young man into damnation, and The Problem of Pain (1940) which tackled the question of why a good and all-powerful God would allow so much suffering in the world. According to Lewis, such suffering arose from the evil choices made by people. 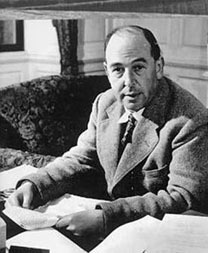 Lewis expanded his ideas on ethics and spirituality in Mere Christianity (1943), which originated In 1941 as a series of live radio broadcasts for the BBC. Throughout this period he remained a highly productive academic, teaching as well as producing significant works of literary criticism (especially his preface to Milton's Paradise Lost). But spirituality was not an interest Lewis set aside, even when dealing ably in other genres. Thus in The Allegory of Love (1936), a history of love literature from the early Middle Ages to Shakespearian times, he observes: "When Catholicism goes bad it becomes the world-old, world-wide religion of amulets and holy places and priest craft; Protestantism, in its corresponding decay, becomes a vague mist of ethical platitudes." Another fruitful outlet for his interests came through his various works of fiction: mainstream, science fiction, and fantasy. In The Great Divorce he explores the notion that the damned are not really barred from heaven, but rather choose not to enter because doing so would seem to require uncomfortable changes and acclimations. (Notably the narrator encounters Lewis's literary hero, George MacDonald in his foray into the foothills of heaven.) His famed Space Trilogy, which includes Perelandra, imagined a cosmic system in which a kind of angelic overlord is charged with guiding each planet. But on Earth this angel, Satan, leads the people astray. But perhaps Lewis's most famous Christian-influenced fiction was his seven part series, The Chronicles of Narnia. The work was inspired in part by Lewis's real stint as a host for young English refugees. Fleeing Nazi bombing raids on their city, a group of children spent a long period at his home, The Kilns, and one in particular liked to pretend about a wardrobe having a secret back entrance. Lewis was charmed by the idea, which also called to mind the magic wardrobe in Edith Nesbit's The Aunt and Anabel, a tale he'd loved as a boy. In Lewis's iteration the wardrobe evolved into a magic portal to the land of Narnia, where four refugee children learn compassion, courage, faith, and loyalty as they battle the White Witch and befriend a Christ-like lion named Aslan. Ironically, when Lewis shared his ideas for The Lion, the Witch, and the Wardrobe (1950) with his good friend and fellow fantasy author J. R. R. Tolkien, that author didn't think much of the tale. He considered the book overloaded with heavy-handed Christian ideology and by too many conflicting elements -- talking animals, witches, and children, all in one book. Ironically, many of the elements that Tolkien predicted would leave people confused and overwhelmed eventually endeared the work to them. More than fifty years after its original publication, the Narnia series continues to be a immensely popular, with children and adults alike. But passionate differences of opinion were part of the ongoing texture of Tolkien and Lewis's friendship, and becoming at times a tricky shoal to navigate. In fact, when Lewis was finally married, to divorcee Joy Davidman Gresham in 1956, he did not mention the development to Tolkien who, as a Catholic, strongly opposed divorce. Lewis also downplayed the development to himself: tacitly it was a marriage of convenience, to keep Gresham and her young sons from being expelled from the country. The pair had originally met after a correspondence initiated by Gresham in 1950. Raised a Jew, she had been an atheist before reading Lewis's works and became converted largely on the strength of their arguments. She naturally became a huge fan and wrote to him, initiating a lengthy and joyful relationship of correspondence. They met face to face in 1952, when she traveled to England, and became even better friends. After Joy's alcoholic husband abandoned her for another woman, she and her boys moved to England. Lewis later invited them to move in while Joy fought what turned out to be the onset of cancer. As deportation loomed, the pair entered into marriage with a simple civil ceremony. But the various forces threatening to take Joy's company from him made Lewis realize how deeply he cared for her, and in 1957 they remarried, this time with a religious ceremony. After a brief remission of the cancer, Joy died in 1960. A dramatization of their relationship appears in Shadowlands, starring Anthony Hopkins and Debra Winger, which first appeared on HBO in 1993. Their relationship also forms the subject of Brian Sibley's C. S. Lewis through the Shadowlands: The True Story of His Life with Joy Davidman and Douglas Gresham's Lenten Lands, the story as experienced by Joy's youngest son. Lewis's own reflections on the loss of his wife appear in A Grief Observed, published in 1961 under the pseudonym N. W. Clerk. Therein he reveals his private struggles with grief and with his understanding of God, and he suggests that such profound loss was an opportunity for him to explore the structure of his own faith and perception, to find them wanting, and arrive at a more genuine understanding. Despite his fruitful efforts to make peace with Joy's passing, Lewis's health continued to deteriorate after Joy's death. In the summer of 1963 he resigned his position at Cambridge, dying quietly at home on 22 November. Despite his fame, only a brief obituary appeared in the newspaper, the event being overshadowed by the assassination of U.S. President John F. Kennedy that same day. Author Aldous Huxley also died on that day, and Peter Kreeft's Between Heaven and Hell: A Dialog Somewhere Beyond Death with John F. Kennedy, C. S. Lewis & Aldous Huxley uses the coincidence to contrast the differences in beliefs and personality between the three notables. Over the years dozens of books have been published about Lewis's life and works, of varying levels of scholarship. His own impressions are captured in his early autobiography Surprised by Joy: The Shape of My Early Life (1955). His early years can also be sampled in All My Road Before Me: The Diary of C. S. Lewis 1922-27 (1993).